An aquatic turtle diet offering complete and balanced nutrition that addresses most of the common problems hobbyists encounter. 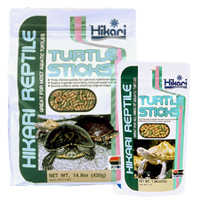 Contains three distinct colored sticks each with different indispensable nutrients for your aquatic turtle. Yellow Stick – Staple Nutrition StickContains the highest quality proteins, minerals and multi-vitamins to promote growth and help keep aquatic turtles in peak condition. Green Stick – Calcium StickRich in lactic acid calcium for improved shell structure while helping prevent disease caused by calcium deficiency. Red Stick – Conditioning StickContains chitosan extracted from crustaceans to activate a turtle’s metabolism and make their skin more resilient. Easily digestible thereby reducing waste and the associated water quality problems. Absorbs water easily and quickly becoming soft while retaining it’s shape. Will not cloud your water. Feed several times daily the amount your turtle will completely consume within ten minutes. Care should be taken to avoid over-feeding and always remove uneaten food after feeding period.